Synthetic sapphire is evolving as a major industrial material due to its mechanical, optical, structural, thermal and chemical properties. Also, the availability of cheap synthetic sapphire is driving the use of this material in many industries. Synthetic sapphire is gaining increasing demand for production of windows owing to its extraordinary scratch-resistant properties and high-transparency to the wavelength of light. Also, due to its excellent electrical insulating properties, synthetic sapphire is being used widely as a substrate for semiconducting circuits. Moreover, biocompatibility of monocrystalline sapphire has made it suitable for hip joint endoprostheses in the medical industry. The creation of synthetic sapphire has also increased in the recent years due to its affordability as compared to its natural version and rising need in the industrial application. With the increasing demand, manufacturers are using various methods to produce synthetic sapphire. However, different methods used in manufacturing have a different impact on the shape and quality of sapphire produced. Moreover, regulatory bodies such as the U.S. Federal Trade Commission has introduced specific guideline regarding the sales of synthetic gems. This is also playing an important role in manufacturing of synthetic sapphire. As per the report by Persistence Market Research, the global synthetic sapphire market is anticipated to see a significant growth during the forecast period 2017-2024. 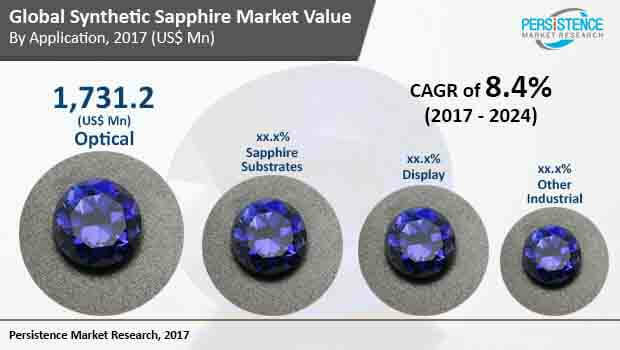 The report also expects the global synthetic sapphire market to bring in US$ 9,255.7 Million revenue by the end of 2024. Optical properties of synthetic sapphire are extraordinary, hence it is becoming the most preferred material choice for engineers dealing with high temperature, high pressure, and harsh chemical conditions. This is due to synthetic sapphire’s high strength, wear resistance, temperature stability and chemical inertness. Synthetic sapphire windows are being used on a large scale to produce sapphire windows as it is stronger than standard glass windows. These sapphire windows are being used on a large scale in vacuum chambers and high pressure for spectroscopy, crystal in watches, windows in barcode scanner in grocery stores. Its use as shatter resistant windows in vehicles and to develop military armor suits is also increasing. Synthetic sapphire is forming as a basis for future electronics. With increasing industrial use, synthetic sapphire wafer has become a basic component for LED production. Synthetic sapphire wafer consumption in LED manufacturing is also increasing. Synthetic sapphire wafer manufacturers are also focusing on cost management by taking into account the high volume production. Manufacturers are also focusing on developing colorless synthetic sapphire wafers due to the negative effects of color sapphire wafers, especially for LEDs. In the recent years, the demand for high-quality colorless sapphire has increased by LED companies as an effective solution for improving product quality and cost management. Consumer electronics also present a huge growth opportunity for synthetic sapphire manufacturers. Smartphone companies and other consumer electronics manufacturers’ are showing interest in use of synthetic sapphire. With increasing production and demand for consumer electronics worldwide, manufacturers of are focusing on developing synthetic sapphire that can be used in consumer electronic products. Namiki Precision Jewel Co., Ltd.